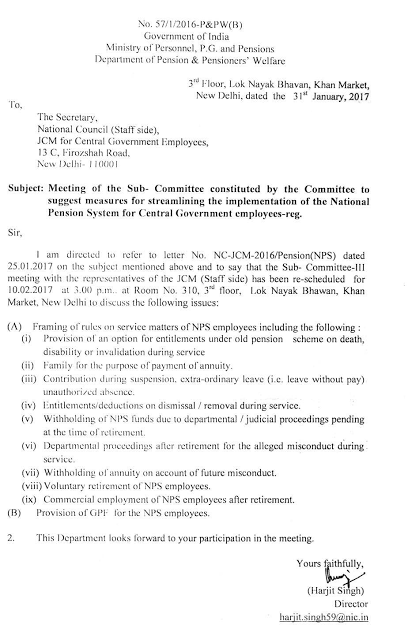 NPS committee constituted by the Government to streamline the National Pension System has called the JCM Staff Side for second round of discussion on 10.02.2017. As per the notified agenda, the committee is proposing discussion on only cosmetic changes in NPS. Basic issues such as (1) scrapping of NPS (2) Guaranteed Minimum pension to NPS Pensioners ie; 50% of the last pay drawn should be guaranteed by Government as minimum pension even if the returns from annuity insurance scheme amount is less than the 50%. and (3) Exemption of Central Govt. Employees from the purview of NPS, are not included in the agenda of the meeting even though the Cabinet Secretary has assured JCM Staff Side Chairman and Secretary Shri. Raghavayya and Shri Shiv Gopal Misra on 19th January 2017 that -- "so far as issue of NPS is concerned he has already directed the Committee to hold meeting with Staff Side". From reading the agenda it can be seen that main demands of the Staff Side are avoided, thus betraying the cause of thousands of younger generation Central Government Employees who joined service after 01.01.2004. Their hopes are shattered and belied. NJCA should revive the deferred strike to protect the interest of younger generations. Let us make the 16th March 2017 Confederation Strike a grand success.